Unit testing is one of the programming disciplines that, to my mind at least, sets apart the reputable developers from the cowboys. Test driven development has become increasingly popular over the past few years, and for many teams, it’s becoming as fundamental a discipline as using source control. It’s an idea that sounds almost like a no-brainer at first: you write a bunch of methods that feed test data into your code and examine the result, and they report either success or failure. Then when you start extending and modifying your code, you can re-run your tests to check that everything still works as it’s supposed to, and you haven’t broken any dependencies. Yet of all the programming disciplines that I’ve had to get to grips with over the years, unit testing has probably been one of the most difficult. Setting up your project to facilitate automated testing involves quite a lot of groundwork. You have to configure a test environment, perhaps with a test database or other form of test data source, and you also have to completely re-think the way you write your code. It requires greater discipline — it’s all too easy to think “Stuff that,” and slip into the old mindset of just slapping down your code and testing it manually. Some legacy code may seem almost impossible to test, especially if it is a Big Ball of Mud with long, multi-purpose methods and no clear separation of concerns. Then there is the question of what to do with external dependencies — components that are beyond the control of your unit tests, such as third party web services, input devices, and even the current date and time. If you’re wrestling with problems such as these, Roy Osherove’s book, The Art of Unit Testing, is a must-read. Most treatments of unit testing that I’ve come across only cover the topic at a fairly basic level, but this one picks up where they leave off. I was pleased to see some good solid chapters on stubs, mocks and dependency injection, for instance: these are essential tools needed to break external dependencies. I was also pleased to see a whole chapter devoted to working effectively with legacy code; another whole chapter is devoted to the political and organisational implications of introducing unit testing into your organisation. My only disappointment was that four major, and potentially thorny, aspects of the subject — database, UI, web and thread-related testing — were only given a brief overview in the second half of Appendix B. 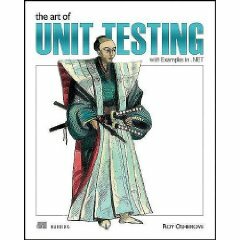 Of course it could be argued that these were outside the scope of this book — indeed, Osherove argues that unit testing in some of these areas in particular have a relatively low return on investment — and in others, unit testing frameworks and methodologies are still very much in their infancy. However, I was hoping for a somewhat more extensive treatment of these aspects of the subject and it was a little bit disappointing that they only got six pages. But this doesn’t detract from the value of the book. Whether unit testing is your “thing” or not, it is very much a must-read for every working .NET developer, and indeed for developers working with other languages too. It deserves to be as much a classic as books such as Code Complete, Design Patterns, or Martin Fowler’s Refactoring. Posted at 08:00 on 29 September 2009.